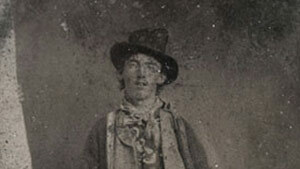 William Koch paid over $2 million for the only authenticated picture of Billy the Kid. (CNN) -- A 130-year-old photo, billed as the only authenticated picture of legendary outlaw Billy the Kid, sold for $2.3 million at a Denver auction Saturday night. The Kid reportedly paid 25 cents to have the photo taken in Fort Sumner, New Mexico. The Old West Show & Auction had estimated the tintype -- an early photographic technique that used metal plates -- to bring in between $300,000 and $400,000. "When the bidding ended, the whole room erupted in clapping and people leapt to their feet," said Melissa McCracken, spokeswoman for the auction. "I've never experienced anything like this before." The winning bidder was billionaire William Koch who founded Oxbow Carbon, with reported sales of $4 billion annually. Koch comes from a well-known family whose last name has made headlines in the past year for their political involvement. David Koch is William's twin. David and another brother, Charles, operate Koch Industries and are prominent conservative activists. Koch Industries is a large, privately owned conglomerate with interests ranging from petroleum to plastics to paper. The Denver auction started with five bidders. Within two minutes, the bids shot up to a million dollars. "The bidding was absolutely crazy," McCracken said. The outlaw was born Henry McCarty but was also known as William H. Bonney and Henry Antrim. Popular history has him gunning down 21 men, but many historians say the number was closer to nine. He later died at the hands of another sheriff when he was only 21. The annual auction is known for its collection of Wild West memorabilia. Last year, it auctioned off the gun collection of Roy Rogers, "the King of the Cowboys" who appeared in more than 100 movies.